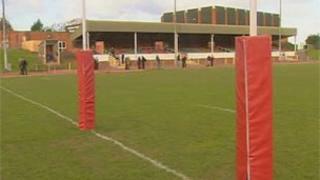 A £6.5m new rugby academy and leisure complex in Conwy has taken a step forward. Wynne Construction has been chosen as the developer for the indoor venue at Parc Eirias, Colwyn Bay. Work begins in February and will take around seven months to complete. The Welsh Rugby Union (WRU) will base its North Wales rugby academy at the centre thanks to the inclusion of sports analysis facilities. The centre also includes conference, classroom and gym facilities. More than half of the funding comes from the European Regional Development Fund (ERDF) and Welsh Assembly Government Targeted Match Fund. The Welsh Assembly Strategic Regeneration Area fund, Conwy County Borough Council and the WRU also contributed towards the cost of the build, which is part of wider regeneration in the area. The cabinet member responsible for corporate modernisation, Cllr Graham Rees, said: "This is an exciting scheme for both Colwyn Bay and the north Wales region and the council has worked hard over recent years to make this project a reality." Council leader Dilwyn Roberts, said: "This Parc Eirias development is a key element in our vision to revitalise the town." A further tender will begin shortly for the stadium pitch, in order to make the surface suitable for international rugby and football plus protection for outdoor concerts.